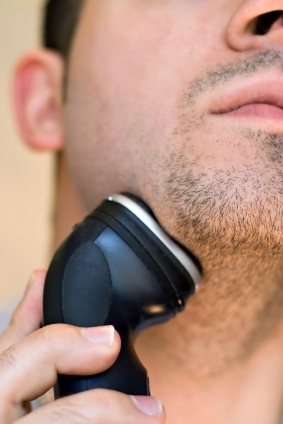 One of the best ways to reduce shaving irritation and prevent ingrown hairs is to use an electric razor. The shave is generally not as close as one offered by a traditional razor, but it’s the perfect tool for the guy who’s always on the go. 1. Cleanse. Wash your face with the recommended cleanser for your skin type. Rinse thoroughly and pat dry. 2. Prep the skin. Apply our Electric Shaving Lotion to the beard area with a cotton ball. Not only will it help disinfect the skin, but it will also absorb any excess oil and moisture from the skin. Doing so allows the hair to rise up, thus enabling a closer shave. Wait for a few minutes for the product to soak into the skin. 3. Shave slowly. Go against the grain of the beard so the razor can pull the hair up and out to achieve a closer shave. 4. Tone. Dampen a cotton pad with a toner of your choice and wipe in circular motions moving outwards. A favorite is our Seaweed Cleansing Lotion; it’s a non-drying, alcohol-free toner formulated with Seaweed and Aloe Extract for anti-inflammatory benefits. 5. Moisturize. Apply a post-shave product such as our Protein After Shave Lotion to cool and soothe. I dont think the electric shaver is work in a good way as it pulls hair from the skin which never an easy at the beard area, there are many more other type of electric shavers which are more better than this.